This week has been dedicated as putting in a new kitchen week. Not by my good self you understand. No, by people who do know one end of a Screwdriver from the other. There have been sacrifices Microwave meals and not much birding spring to mind although a few meals out have been pleasant. Today I did manage to get out and do a local patch round Caldecote. It was a typical November morning, damp, grey with rain in the air. Nothing unusual in the bird line but a definite increase in numbers of Skylarks, Meadow pipits, Linnets and Reed Bunting. The Linnet flock was c100 birds with perhaps 30 Skylarks and slightly fewer Meadow pipits. I think I'll have to take a scope to check out the flocks more thoroughly. Very little else though apart from a Fieldfare/Redwing flock, Grey Heron and couple of Kestrels. I stopped to chat to a couple of fellas ferreting, who were having quite a successful day. They commented that the Rabbits were in excellent condition. I presume that was prior to them being dispatched after being netted. Its official Dead Fish are more important than Living Birds. Thats according to the people running the fishing at Draycote Water. I suspected this during the summer after witnessing some brainless individual trying to run 3 Cormorants out of town by chasing them around for nearly an hour in a inflatable. Not much success with the Cormorants but did manage to disturb the rest of the wildlife using the Reservoir. 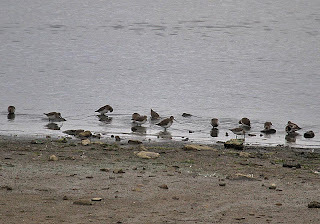 Then today it was reported to me that the same people felt no responsibility towards protecting the wildlife on the reservoir or cooperating with the birders in anyway. OK, the fishery is a business, people may have invested their life savings into it and expect a financial return but in taking on a business so dependant on the natural environment they take on a certain responsibility for that environment in the same way any landowner would? Climbing off high horse there was bit of birding to be done. It must have been a while since I went to Draycote last because the water level was an all time low at least since the 90s anyway. Unfortunately I missed seeing both the Purple Sandpiper and the fly over Brent geese. 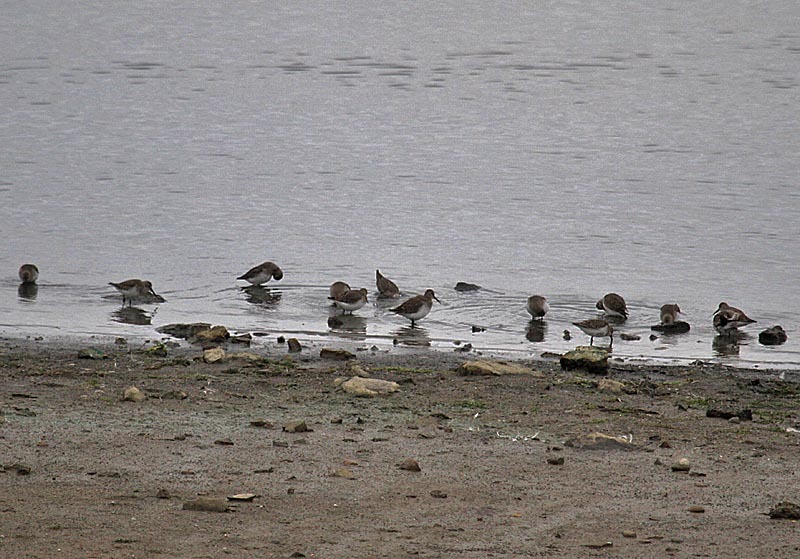 A rock pipit was seen briefly and there was a small flock of 13 Dunlin and a single Redshank at the overflow. Meanwhile back at the mansion its time to make the kitchen fitters another cup of tea.